This blog is inspired by Keith’s blog on his thoughts about other blogs he had been reading. It challenged me to think about my own post and also gave me ‘warm fuzzies’ that my thoughts are contributing to greater conversations. So I thought I would write some responses to some blog posts that have made me think recently. This post by Karen explores how educators can become more future focussed and embrace student centred learning, despite the fact there are unknowns and complex issues to consider. ‘Building planes as they fly is our speciality’ is such a superb analogy for educators. I am developing a loathing for ‘fixed’ unit plans and the need to show resources in beautiful neat folders as the gold standard of a good, organised teacher. If I am embracing student centred learning then the learning should go where the previous learning takes it and not along a path predetermined by me or my HoD. Which is why I am finding myself more and more at odds with some aspects of our assessment driven system – especially with external NCEA assessments which have very specific requirements in order to achieve success. But when something doesn’t go quite to plan, or results dip, it is so easy to fall back into old habits. My favourite advice from this post was to innovate from an informed position and make sure you are using multiple markers to inform your teaching – not just test scores. Make sure you run ideas past a critical friend and then be prepared to change it if it doesn’t work. It also makes me think about why it is so important to share what you are trying to achieve outside of your classroom walls. If you hold onto resources because no-one shares back – everyone loses. You don’t get a chance to improve them, and others don’t get the chance to learn from them. Too often I feel we don’t let ourselves take time when learning new tools to really get a feel for how we can use them best. I have decided this is my remote control rule. If you are too afraid to touch buttons on the remote control to find out what they do, you have become afraid of the new. And if we are unwilling to let our students try things we are not comfortable using – I’d argue that we are not modelling life long learning. Learning from our students empowers our students and gives them confidence to try new things. If teachers are always too afraid to try something new for fear of it not working, then of course out students will adapt this behaviour to themselves and play it safe. Number 3: Pip Cleaves – It’s not them, it’s me – why I can’t do big conferences anymore. I read this post as I was pondering about whether I forced the issue of U-learn with my school. I have been to Ulearn before and really enjoyed it. But Rotorua is expensive to get to, the conference is expensive and I have been away a whole lot already this year for various reasons. I thought I should go up and present and share what I’m doing – but really I do most of that on my blog anyway. So how much would I have got out of it? I have heard or read the books of most of the keynotes. I of course value face to face interactions and would love to have caught up with all the cool peeps that would be there. But in terms of bang for buck – some-one else from my school really would get a lot more from the opportunity. PLD is SOOOOO expensive and often not equitably shared so this is also about a moral responsibility I suppose. The money could be better spent than my going to hear what I already think and to present what I would willing share for free. So I have made the choice to focus instead on educamps (I self funded a trip to Auckland) and teachmeets and real stuff. Real educators sharing what they do. Free, often on a weekend or in own time, and real. I will continue to connect with educators via webinars (Loving the EDCHATNZ MOOC ones even if I didn’t have time for the mooc, thanks MissDtheTeacher and the edchatNZ crew), twitter chats, facebook and the vln. Even the odd coffee or after work drinks. That said, I had MASSIVE FOMO for the recent ISTE conference held in the US (I drooled over the twitter stream) – and so might make a mission to get to that next year. There are more blogs that I read out there too – keep blogging and sharing your stories – as we are all contributing to a conversation that matters. Be sure to check out the EDBLOGNZ page with a list of the NZ educator blogs, if yours isn’t there, just use #edblogNZ when sharing on twitter. So, I’m not sure how to keep this post from being all gushy. And it is impossible to limit it to 3 weeks. Or 3 people for that matter. Sorry Nathaniel and the blogging challenge team. I’m breaking the ‘rules’ and not doing the set assessment task. Again. But over the last 18 months since I really started to immerse myself in a ‘connected’ way with other educators, I have made so many valuable connections who have all shaped my ideas and thinking in some way. Some have supported me, others have challenged me, some have done both at different times. I have soared along currents of dreams and plummeted into holes of disbelief and despair. There have been several times in the last 18 months when I have seriously questioned why I am in education? What am I trying to achieve? Am I doing more harm than good? How can I ask more of already super busy people? Am I actually making the changes or am I just talking about them? How can I motivate my students to see past the exams? How can I expect them to be different in my room to suit me – do I need to change to suit them? How can I put enough time into my students and planning while maintaining the seemingly ever increasing requests for my time in other areas? I applied for a job and it didn’t feel right which was a huge turmoil…. and most important of all – how do I learn to switch off and find time for my family? I keep coming back to a central thought – It is about people. The people, the people, the people. The people I have meet and the ideas they have shared have made such a difference. Are seriously the most amazing people. No kidding. Team work, collaboration, innovation, challenging discussion and mentoring (mostly of me….) all come from this space. Special mention has to go to Matt Nicoll and Chhaya Narayan, we have worked together from the beginning. We are all quite different but all share a similar drive to share our work, be inclusive and support fellow educators. We find time when there is no time to get things done, we work together and enhance each others strengths, we vent and celebrate. It is such a privilege to work with these two people. Paula Hay was so vital to me around making career decisions this year (and her hubby makes AMAZING hot chocolates) and being a voice of calming reason while still maintaining a drive for change. And the rest of the team chips in as time allows for them, keeping us grounded, broad and accessible to many. I have said this somewhere else, but I am so humbled by the educators who join in our sessions and make #scichatNZ the community it has. You all ROCK!! 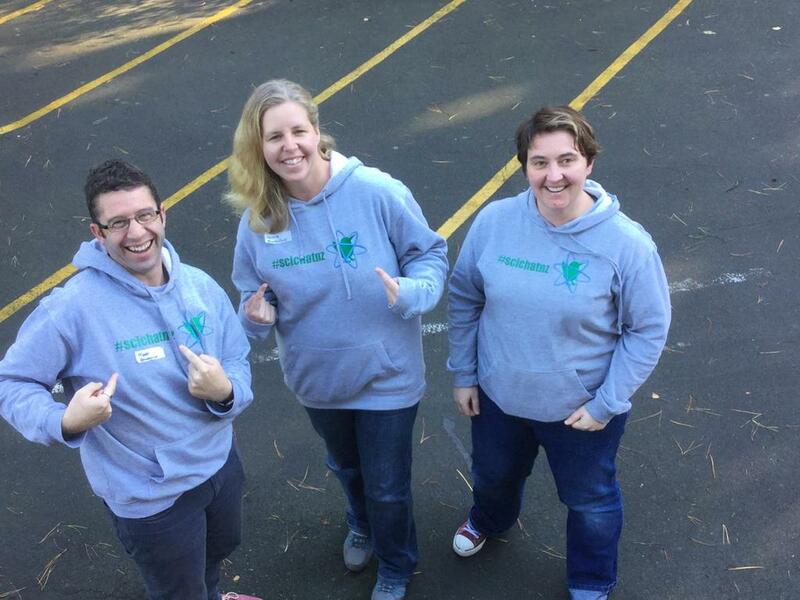 And to Danielle and Karen who helped us get started, thanks for giving me/us the push. When I was accepted into this program I was super excited about what I would learn (and I have learned LOADS). It speaks volumes about my changing mindset that I didn’t even consider who I would meet. But the connections I have made and the people I have meet through this program have definitely been the highlight. Nikkie Laing in particular has made my year with this group – even though she teaches primary we have lots of similar thought processes when it comes to learning, and she has taught me (and shared with me) loads about inquiry learning and the techie sides of Sharepoint. Steve Martin from Howick College has terrible Dad jokes but amazing ideas around competencies and curriculum delivery. Conversation with Chris Clay always get me recharged and remotivated, as well as disruptive :). Shanne is also a Sharepoint Guru, and Ineke helped me get started on using OneNote – which has basically changed how many teachers at my school are delivering the courses and assessments. While not in education, I have learned an enormous amount about networking and facilitating from Anne Taylor. And the super amazing Arnika Brown gave me the push to apply and also deserve a mention for her unceasing support and positivity. Attending the Global educator exchange has facilitated an enormous world wide network of learning and learners for me, and I LOVE reconnecting with these educators via skype calls and webinars. I am currently collaborating with a group of them to organise a global online conference – how freaking awesome is that!! So, I don’t know how else to title twitter chats, facebook groups, OSTA and regional Science teacher get togethers, educamps, eduIgnite evenings, conferences and teachmeets I have attended. Not to mention hashtags I have followed (I soo so so so so loved #notatulearn15 and all the tweets and tweeps that participated). So many educators sharing and debating, passionate and inspired. Many, many people contributed to this learning and I am so thankful for it. The time, effort, determination and dogged resilience of educators continues to astound me. Cause, you know, it is about them :). They are brave, reticent, willing, nervous, confident, problem solvers, leader and workerbees. They are diverse, they keep me on my toes and make sure I am never bored. The try things, are free with feedback, laugh at my lame jokes (sometimes) and remind me that there is more to life than just school. I am so lucky with my family. The hubby is my ROCK. So willing to go with the flow around chats and webinars, comes and watches sports teams or performances, eating endless cheese rolls, flexible with ‘oh s$%^, I forgot I had this on’ and has travelled round the country with me supporting me on conferences and trips. Our extended family are all still working hard with great passion in their chosen areas, and have taught me important values around equality and equity, empathy and being reliable and honest. 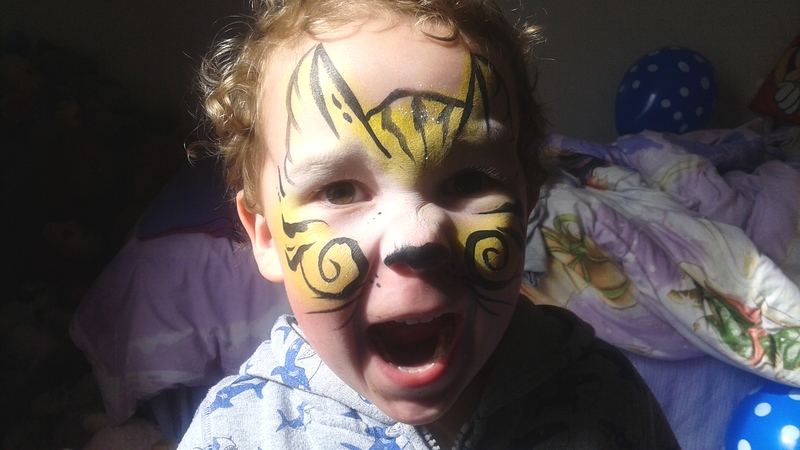 Mr 2 nearly 3 has taught me so much about myself, and what it is to learn. He has put up with Mummy being at meetings or checking e-mails, and has only completely trashed my computer once. He is always learning, always curious, always wanting to get better, playful and cheeky. And terrible. All in one super cute package. I hope I can find a way to make sure that when he get to school, he can continue to be all those things. I am inspired by all of the passionate, caring educators out there working tirelessly to make it so. In my original post, I reflected on how valuable twitter had been for me when I shifted to my new school. It allowed me to access ideas that I hadn’t been able to previously. Even just letting me know about events like teachmeets or educamps that weren’t advertised at my school. Getting access to digital resources, or even reminders about pinterest boards was a huge advantage. When I first signed up, I had ‘lurked’ around conversation lacking the confidence to join in. I was delighted when I got a like or a retweet, heartbroken if a question went unreplied to. I still feel occasionally like I don’t quite fit in. Should I really share my blog posts? do I join in a conversation between ‘super awesome amazing people’ I’d be excited to be in the same room with and would go all squawcky if I got to say hello. Do I share links to their blogs? do I need to ask permission? Or more recently, when I was on the cusp of 200 views on my blog for a month, I agonised over spamming the twitter feed in the hopes of getting my blog viewed more. I restrained myself (with difficulty) (and didn’t break that ‘magic’ mark) by remembering I blog for me. They are my reflections and thoughts, and while it is flattering people read them, or are inspired by them, this is really my thoughts and my learning. I do sometimes wonder about twitter ‘manners’ – how many times do you repost things? When is too many? I’m sure that on Tuesdays all the none Science tweeps get sick of all the #scichatNZ tweets 🙂 And I do get ‘super’ excited when something I am tweeting about is ‘trending’. It is nice to have some recognition I guess… but really, it is just a numbers game. If some-one follows me, I will follow them back (it can sometimes depend on the number of notifications – if it is way down the list it can get missed). However, when I think about what I have learned through twitter, and the connections I have made ( both professional and real friendships) I am so thankful for the day I listened to Dereck Weymouth talk at Otago Girls high school. I signed up as he spoke, took a while to find my feet, and haven’t looked back. I have had my mind opened, had access to resources (that were actually always there, I just didn’t know how to find them), been able to find tweeps in a similar ‘space’ to mine that I could lean on for reassurance or the occasional reality check. #scichatNZ has been a whole other kettle of fish. From a small beginning at a Core Education day and Karen saying ‘well, why don’t you do it’. I am truly humbled by the amazing group of educators who pitch in to help facilitate PD for free. We are all so busy with our jobs and lives, yet we all give our time so freely because we are learning as well. And our regulars, who join in every fortnight and constantly inspire and challenge me to get better at what I do. Yes, we might be similar in terms of our ideas and passions, but we try really hard to challenge ourselves to be better, to be inclusive of new people and support them. We have had a variety of guest moderators – including Chris Clay, Sir Peter Gluckman, Sonya van Schaijik and Adam Taylor who hosted from the USA at 3am his time…… who keep the topics fresh and the perspectives changing. I certainly don’t think we consider ourselves ‘elite’ though. I certainly don’t – I have always said about how setting up #scichatNZ was a selfish thing because I wanted to learn from it too. Maybe we are intimidating to some educators who are a little nervous about making the plunge like I was just over a year ago…. but to others we are ‘wasting our time with that twitter nonsense’. I get endless teasing from staff when they find me on twitter at lunch times 🙂 My students get kind of weirded out – especially if I have more followers than them. Perhaps we just need to accept that there are different strokes for different folks. For me, twitter has been an AMAZING way to expand my professional learning, and I hope I have helped the professional learning of others. I have connected with some truly dedicated people working hard to improve themselves and others. So my wonder at twitter hasn’t changed. My awe and gratitude for scichatNZ hasn’t changed. My awareness of my digital footprint has changed, and I do think more carefully about my retweets and likes. I do try to keep my facebook for ‘personal’ and my twitter for ‘professional’ but there is always some cross over. I do feel more like a contributor now than I did – but I still take a great deal. My respect for my PLN reaches past the stars out to the limits of the ideas we have. #scichatNZ is a constant source of inspiration, ideas and challenge. I am really loving the blogging challenge. It is stretching some brain muscles in a super good way. While I blog for myself anyway, it has been really good to have some leading questions to get me thinking about other aspects of my teaching and learning practice. 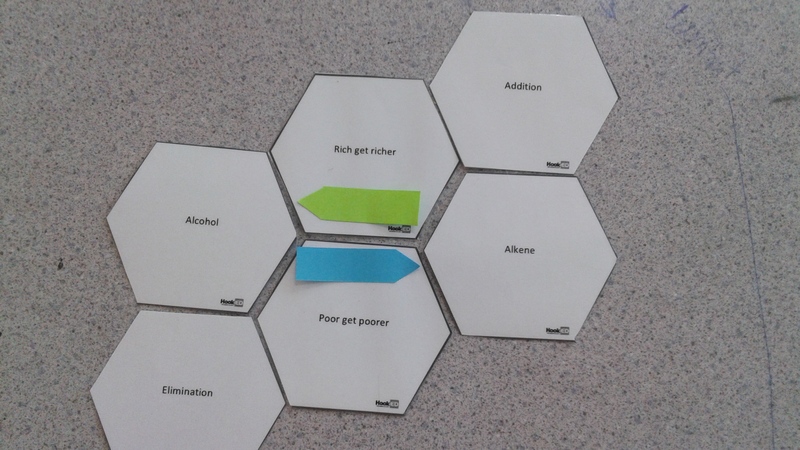 For today, that is a resource I have made and used in my class room, and how/why/what can I do to make it better. So, I am doing two – both quite different, but both super useful. 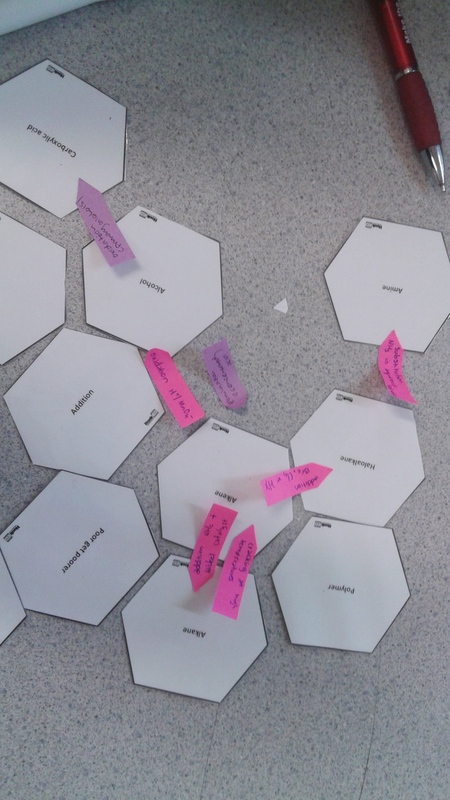 I also get the students to make a big paper mindmap on an A3 piece of paper, and we use SOLO hexagons to link the different groups together as we put that paper copy together. This helps students make links between the silo’d functional groups. A part of Organic Chemistry students struggle with is the ‘puzzle’ questions. Eg How would you distinguish between families? Filling in a flow chart? I have X, Y, Z bottles, how can I tell what is in each? Because the other standards are much more ‘discrete’ with their questions (ie in Atomic structure and bonding, you are not often asked about a properties of solids question in conjunction with a shape or polarity question) some students do tend to struggle with the connections required for Organic. On the flip side, other students love it, it just clicks for them. Which makes it even harder for those it doesn’t click for. Making connections is hard – especially hard for students who are used to learning pieces of information in discrete packages. It is also hard to scaffold information by not putting it into discrete packages. When I teach Organic, I am so aware that I teach about alkanes, and then alkenes, and then the reactions between them. And then Haloalkanes, then Alcohols. We might then go over addition reactions and substitution reactions. But putting those ideas together is a challenge – for me, I just think them all at once. But how can you scaffold so many ideas to teach it all at once? If you know, please get in touch. I use this to introduce buffers in L3 Chem. Buffers are HARD. There is some funky maths, some abstract ideas around weak acids or bases, and assumptions you need to remember that don’t always make perfect sense to a ‘suspicious/critical’ mind. I made this resource when I was at teachers college – so 6 years ago. I sweated over it, wondered if it was good enough, talked about it with my lecturer (the amazing Karyn Fielding – a super star) and then now that I still use it, I am glad of the effort I put in. But I have also realised that really, the questions are not quite so important as I thought at the time – it is the skill I am trying to get my students to acquire with this activity that is important. To illustrate, I once shared this with my last school during staff PD. Seeing as I am a ‘tech’ person, there were a few raised eyebrows as I gave the staff room the reading, and said ‘you have 3 minutes to tell me what this is about’. Well, the injustice!!!!! Some took one look at it and sat back seeing it was an impossible task. Others diligently started at the beginning trudging through. Some skimmed over looking at the pictures. Some loudly said Chemistry and sports were stupid 🙂 Not one person did what somewhere along the lines I had been taught or learned to do when reading a non fiction article – read the intro, then read the summary. This tells you super quickly what the whole thing is about – you don’t need to know all the details to grasp the key concepts. I do the same thing with my students. The panic on the diligent wee angels faces as they frantically try to read the whole thing in three minutes. The indifference from those that don’t even try to. The confusion of those not sure what to do. Some just smirk – although some of those doing PE will start reading through with a more genuine interest. None of them has ever skimmed it, they just try to read the whole thing start to finish. So I tell them about breaking the article down. Read the summary. What are the key points? Find them. What are the pictures? A picture tells a thousand words, and so does a graph/chart/equation. So try and get your head round those. They are there to help clarify the text. What about the subtitles? Do they give any clues? And the lesson is less about buffers and more about critical literacy I guess. It is an important skill that is often overlooked I think. As I tell my students, even the most diligent, organised amongst you will still have those weeks were you have MILLIONS of readings at uni to do, and being able to skim/bluff your way through a tute is ESSENTIAL. But also, there are real life situations too when this is an important skill. For example, when I was pregnant, I had a horrid time. I got so much paper shoved at me, with information about C sections, turning, induction, anathestics, risks and reviews – I was SOOOOOO confused. And I am pretty good at interpreting information from written papers. So being able to skim a document quickly and get the relevant information from it is not just an academic skill. It is a life skill, for mortgages, contracts, user manuals, info from medical people, all variety of things. Blogging Challenge – How can I use NCEA better? So, I am being cheeky and using this post to tick ALL 3 boxes of the blogging challenge. Does this mean I get credit for all 3???? Credit farming breaks my heart. It actually makes a little piece of my happy teacher persona die. Unlike fairies, no amount of clapping will bring it back. Because to me, when a students says ‘I’m not going for these credits so I am not doing this’ or ‘is this worth credits’ or ‘why are you telling us about this if it isn’t in the exam’ or I already have 80 credits so do I REALLY need to do this’ they are telling me they don’t love learning, they don’t love Science (I am baised, but how could you not love Science) and that they are settling for less. The affect of assessment is really starting to get me down. I blogged about this in April this year during the #edchatNZ chat on innovative assessment. I was getting soooo super frustrated with myself and my thinking about the role of assessment in schools (and life). In the conversations I have (online and F2F) we dream so big about cross curricular, real life, meaningful learning. And then I am really struggling to turn this in to meaningful programmes. I am really jealous of Matty Nicoll’s Nature of Science course that he has built. But when we were planning our next #scichatNZ topic (which will ROCK by the way) I had to admit that I had never even considered a cross curricular approach for my senior classes. But in ‘real’ life, the ability to have multiple skill sets is in demand. I recently read ‘too big to know‘ (after a recommendation from the fabulous Danielle Myburgh I saw on twitter) which challenges what we define as knowledge in the digital age, and something that really struck me from this book was the use of crowd sourcing for data analysis and/or solving complex problems. It is easier than ever before to use a network of knowledge rather than single sources. Yet, we still teach in single silos…. Which hit my brain like a hammer. And how can I get my students to love learning for learnings sake. To be more interested in the world around them, more empathetic with the views of others, more critical of marketing techniques trying to manipulate their choices and more aware of the society and communities they live in. How can I find a way to give them credit for that? Something I have become acutely aware of this year is the power of telling stories. I had a huge focus earlier on in my teaching (I have only been teaching for 6 years, so in some terms I am probably still finding my feet in teacher years……) about removing myself from the front of the class room. I found my first year or two I made ‘beautiful’ presentations using power point, keynote and prezi and would work my way through them. Teaching girls, they would write them all down diligently and I thought I had the teaching thing sorted. Then I started to get a bit braver and ask some questions during my presentations. The response I got was ‘I’m still writing, I can’t possibly think about answering a question’. With teaching boys in the last two years, diligently writing notes wasn’t always their thing. So the presentation crowd control went out the window. And like most things, I have discovered that moderation is key. Dare I say it in a public, enlightened forum, but sometimes, sitting quietly and getting some notes down is important. Just not every day, every lesson. I am really lucky with my room that I have a wireless projector, and two white boards, one front, one back, so I can shift the focus. My students have gotten used to me putting my ‘notes’ online so have (mostly) got over the need to copy down word for word what is written on the screen. So when I am telling stories or sharing ideas, I have freedom (and confidence) to wander, to down tools and change tack, to use either end of my room, or both. And about when I was really unsure, I was listening to some TED talks. Maybe it is just me, but I can waste HOURS watching those talks. It got me thinking though, that actually listening to some-one speaking is still a good way to get the information across. Done well, a presentation is incredibly powerful. Teachers shouldn’t write them off. So the biggest evolution I can think about for my teaching so far is how I use my voice and tell the ‘stories’ I need to in the class room. For a while there, I went to far and didn’t use it enough. Turns out, students like to listen to me, and now that I have changed the focus from the slides to me, they are more confident to challenge and ask questions of what I am saying. Being able to move about the room makes me accessible to each student. And because I do it in moderation, it makes it more effective. So don’t give up your voice. Each year, I start my Level 2 Chemistry class the same way – by playing Three little Birds at the start of the lesson. It is to remind me and my students, but me mostly, that despite the big step up to Level 7 of the curriculum and the tough journey that some students face, everything will be alright. It is a big step up from NCEA Level One Science to NCEA Level Two Chemistry and some students really do struggle with the increased complexity of ideas, the increased expectations around answers and their increases workload across all subjects. I will often use music throughout the year as a starter – but especially for Level Two chem. Thinking about it now, I am not quite sure why…… but the blogging challenge for Connected educators month has at least got me thinking about some of the songs I often use. I guess I use them as starters to break the ice, as cues for students to remind them about different topics, and as a reminder for myself that sometimes things are hard. I love music, and took lessons for years. My Mum MADE me, as I struggled with music (I am still envious of people that are ‘naturally’ musical) and she thought it was good for me to do something I had to work hard for. I am so glad I was made to stick at it, and being able to read music as well as scramble something out on a guitar and the piano have come in handy thoughout life. I will often have something playing in the back ground of my class room, especially during practicals. Sometimes it is a compromise around getting students to remove their headphones and participate more with the world, at other times it is just to have a nicer, more relaxed atmosphere in the room. And recently, I was playing some music, and (as often happens) my album of choice for switched. Some boys put themselves on, and it was awesome. A great reminder that I teach some amazing students.